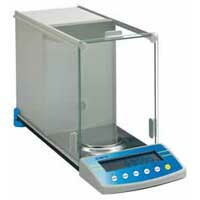 The AEA series are the professional series of analytical balances in the Adam range. The balances have automatic calibration with internal calibration weight as well as a large graphic LCD display with back light and RS-232 interface for GLP compliant documentation. The AEA series has 15 weighing units including a user programmable custom unit as well as built-in applications including weighing, parts counting, percent weighing, averaging, filling guide, animal weighing, formulation mode and density determination. The range includes a dual range 4/5 decimal place and a semi-micro balance. Interface RS-232, bi-directional, 2400 - 19200 baud with handshaking and complete control of balance functions. Calibration Calibration with internal mass. Optionally the user can use an external mass. Display Graphics LCD with Backlight, 134mm x 40mm / 5.2″ x 1.6″. Displays weighing information, date, time, 0-100% capacity and special data for weighing functions. Functions Weighing, Parts Counting, Check weighing, Statistics, Percent Weighing, Animal Weighing, Formulation mode, Density Determination of solids and liquids, Filling program. Ambient temperature control for calibration. Full control of filters for ambient conditions, error messages, menu to access all parameters and enable or disable all modes and functions. Weigh below ability.